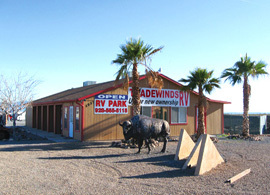 Maximum RV Length: 65 ft.
107-space family and pet friendly RV park located in the high desert between Kingman and Bullhead City, AZ. 100 miles from Las Vegas, 15 miles from Laughlin, NV. Level spaces with full hook-ups, recreation room, laundry. Meeting room with big-screen TV, lots of trees, great desert off-road, Bocce Ball Court, horseshoe pit, outside covered bar with large BBQ grill at recreation building and 5 concrete fire pits scattered around the park, hiking and horse trails. We have also added a pool table, card tables in the recreation room. Free WiFi. Take State Highway 68 from Kingman, AZ, 15 miles west or 15 miles east of Bullhead City, AZ. The park is located directly behind "Off-Road Diner & Bar" at South Emery Park Road. Receive 50% off each night up to 3 nights.